"This terror of the skies was born out of Dark Elixir Undetectable by the Seeking Air Mine Minions materialize with ease, but are fragile in our world." The Mnion is a fast, cheap and relatively weak, ranged flying unit. 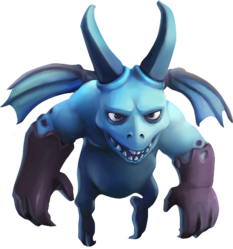 Its appearance is that of a gargoyle with large horns, stubby wings and large hands with sharp vicious claws that are covered in what seems to be dark elixir. Because it is a flying troop, it cannot be attacked by Cannon., Mortars, or X-Bows in Ground Mode but is extremely vulnerable to Air Defenses and Air Bombs. Although out of all Dark Elixir Troops the Minion has the lowest health and does the least damage per second, it has the fastest training time and requires the least housing space. On a per housing space basis, the Minion has the highest DPS of all Dark Elixir Troops (and is fifth among all troops to the Wizard, Goblin, Balloon and Barbarian). Seeking Air Mines do not detect Minions, but regular Air Bombs do, and can kill large groups quickly. Minions have no preferred target when attacking; they will simply attack the closest building to them. 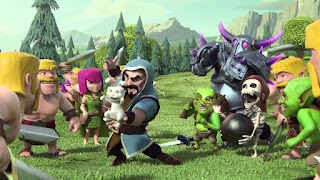 However, once they become aware of enemy Clan Castle troops, Heroes or Skeleton Trap skeletons (either by being attacked themselves or being near another friendly troop under attack), they will leave their previously targeted building and engage the enemy troops instead. Once all of the nearby enemy troops are defeated, they will proceed to attack the nearest building from their current location. It is really helpful to have an Air Bomb in case you are attacked by Minions. It's the biggest weak spot for a Minion, especially if the attacker has multiple Minions, as Air Bombs do splash damage and can wipe out an entire group at once. For this reason it is helpful to place the Air Bombs near storages/Town Hall. Defend Air Defenses, Wizard Towers, X-Bows, and Archer Towers well so the Minions don't have free rein. Minions, although individually weak, are very powerful in large numbers. Make sure to protect Archer Towers and Air Defenses with a Wizard Tower which does devastating splash damage to hordes of Minions. If your attacker plans on deploying a large number of Minions, they will typically try to trigger your Air Bombs first with single Minions deployed at several points around your base. To counter this, make sure the trigger radius of each Air Bomb is at least behind the first row of defended buildings; this will help ensure that the single Minions will be destroyed by other defenses before they can trigger the Air Bombs. Minions are useful in the Clan Castle as they can attack both ground and air units for a decent amount of damage, and can only be hit by Dragons, Archers, Wizards, Witches and other Minions. It is extremely useful to carry a small number of Minions (10 or so) to pick off buildings that are defended by ground defenses only (Mortars, Cannons, X-Bows in Ground Mode). Minions are relatively inexpensive and take up only 2 housing spaces, making them well suited to use in a group rush strategy. Minions can be destroyed by a single Air Bomb; therefore a good strategy is to deploy them one at a time in different locations to set off the Air Bombs, and then follow up by deploying them en masse. Note that you cannot test for Seeking Air Mines in this manner, as these traps do not target Minions. As is the case with all flying units, Archer Towers, Wizard Towers and Air Defenses should be taken out before deploying Minions. Using Giants as a distraction when using Minions to attack other buildings is a good idea since the Giants will attack the defensive buildings and keep them occupied while the Minions attack all the outside buildings achieving at least 50% damage. Note that while Giants can be used to destroy an Air Defense, they will not occupy its attention while it is being attacked (it will still shoot at your Minions). Like Balloons, Minions are exceptionally useful in the Single Player Campaign. You can simply destroy all of the Air Defenses, Archer Towers and Wizard Towers, then deploy a single Minion. It will destroy every building. It takes a bit of patience, but it pays off at the end. In the Single Player Campaign, there is no time limit, so one unthreatened Minion will eventually destroy every building. Important note: In many cases a single Minion will take enough time to destroy the remaining buildings that your game will time out due to inactivity, which will cause your attack to end prematurely and be unsuccessful (regardless of how many stars you had earned to that point). To prevent this from happening either deploy multiple Minions, move your screen around, tap in the red zone, or simply change the view every few moments by panning or zooming. Minions can overpower Air Defenses as they only target one Minion at a time; but beware of Wizard Towers which can vaporize entire swarms of Minions. A good way to use minions is to use a meatshield such as Dragons or Lava Hounds as most Air Defenses and Air Bombs can kill Minions very quickly. The Minion's appearance changes at levels 3, 5, 6, and 7. At level 3, the Minion's skin changes from light blue to royal blue, with its horns and forearms a slightly darker shade of blue. At level 5, the Minion's skin turns gray, and its horns and forearms both turn black. The eyes also glow a ghostly white, making it resemble a fully-fledged gargoyle. At level 6, the Minion's skin turn reddish purple. Its wings also turn into light coloured purple, similar to Level 2 Dragon. At level 7, the minion becomes a rough orchid. Its horns become orange near the tips, and his wings turn orange. The Minion was added in the 12 March 2013 update. Their appearance resembles that of a gargoyle. In the Japanese language setting of the game, the Minion's name translates literally to "Gargoyle". Blue particles can be seen when the spit dark elixir hits the buildings. You can have a maximum of 120 Minions at one time in a complete set of fully upgraded Army Camps. This number increases to 137 if you include the 17 that can fit into a fully upgraded Clan Castle. Tapping on the Army Camp will make the Minion sneeze Dark Elixir and they sneeze more of it when at level 6. The Minion is the fastest flying unit, and one of the fastest troops overall along with the Goblin. The Minion and the Healer are the only flying troops that are undetectable by the Seeking Air Mine. As part of the 17 June 2013 update, the colors of the levels 1-2 Minion and the levels 3-4 Minion were swapped. Twister, a Super cell Community Forum moderator, has confirmed that this was an unintended change and was reverted on 24 June 2013. The Minion is the first, and so far only the Dark Elixir Troop that can be upgraded to level 7 in the Laboratory. 0 Response to "Description Offensive Strategy And Upgrade Differences Of Troops Minion In Clash Of Clans MINION"